Weston in bspwm in BunsenLabs Helium-dev in QEMU in Alpine Linux. I know what you mean; but for those that like the stacking window managers (other than gnome and kde), I think enlightenment is the only one seeing regular development for wayland. The terminal's not bad but 53.4MiB for the compositor itself? I was really counting on MATE Terminal 1.20 fixing the annoying "every highlight color is bold" bug. After trying out the daily images for the new release it was still just the same. Anyways, now I'm trying out konsole. So far so good. I actually think it must be the best VTE based one around. Looks just like termite but has tabs & mouse copy/paste. Also, doesn't require "force_color" in my workstations or servers .bashrc. I've also got a working imagemagick script as well as an index.theme patch that will adapt Suru from git to Ubuntu MATE. Still a little rough around the edges but I think it really brings it up to speed with the rest of the distro's endeavors. ^ nice; that wallpaper one of your photographs? i3status for system information in dwm bar. tint2 with some executors for cpu use and load. @PR nah man. It's just off unsplash.com . I've been to busy being a homeowner lately to take any. I always loved that river one that's similar to it that comes with archlabs but can't for the life of me figure out where they got it from. My Suru-MATE script to adapt Suru to Ubuntu-MATE has really come along. 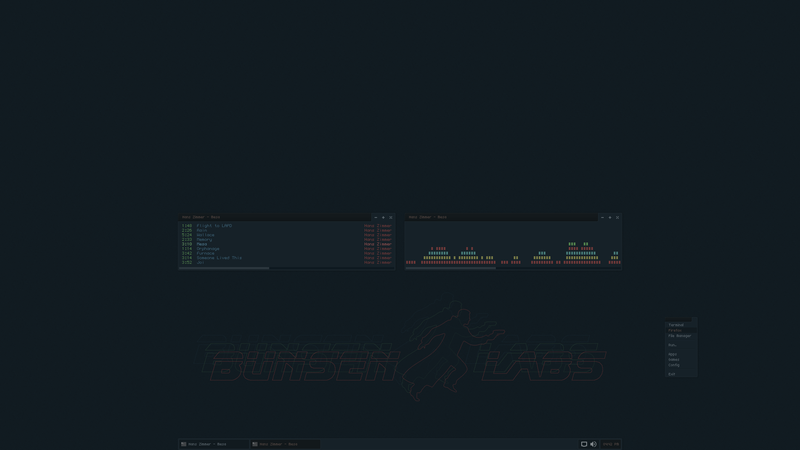 It's on my github in case anyone want's to change the colors to BunsenLabs. https://github.com/willscreel Many thanks to @damo for his paper coloration scripts as reference. Also, I see you're using the backported kernel (which is the best choice for your Broadwell hardware) but have you upgraded the rest of the graphics stack? I have tried a couple of times to get Alpine installed on my machine. Most other linux disros run live and install just fine on this rig. I have tried the 'grsec' kernel and 'vanilla' kernel options. Has anybody experienced similar 'kernel panic' issues? I really like that, is that openbox? Would you mind sharing your themes and configs please? It's pekwm. Here's my dotfiles. I have an openbox version, though it's a slight variation of the screenshot's color scheme. Is that with the ISO image? Be sure to transfer using `cp` or `dd` as they have isohybrid images. The installed system needs to have the filesystem module declared as a kernel command line parameter or it will panic on booting. I will try an install again soon.